“Conway Remembered” is one of the tribute shows in Branson where the impeccable impersonation of Mike Walker brings the music of Conway Twitty back to life at Hamner Variety Theater in Branson. Conway Twitty had made a total of 55 #1 hits. In this tribute show, Mike Walker brings Conway back to the stage where Conway was most adored and remembered. Mike Walker and The Conway Twitty Band will perform a show in Branson that will make everyone in the audience remember the late Conway Twitty as the Country Music icon that he was. Mike performs innumerable hits of Conway with complete vigor that the music of Conway demands. Mike Walker has studied mannerisms and vocal ability to the max of Conway. At the finale of the tribute show, it will leave people wondering how anyone like Mike Walker could encompass someone else’s character and voice so closely. Mike gives the whole audience the ultimate Conway experience. Watch “Conway Remembered” show in Branson and you will truly have a wonderful time along with all the audience applauding as Mike Walker performs his best. You have to see to believe it. Don’t miss to see Mike Walker bring Conway back through his voice. The “Conway Remembered” Tribute show at the Hamner Variety Theater in Branson features beloved music of the late country legend and Grammy Award-winning singer/songwriter, Conway Twitty. As the impersonator and tribute artist of the show, Mike Walker, brings to life the hits of Conway Twitty, with such classics like “Hello Darlin’”, “Slow Hand”, “Don’t Take It Away”, “I Never Go To Heaven”, “Tight Fittin’ Jeans”, “After the Fire is Gone”, and much more. 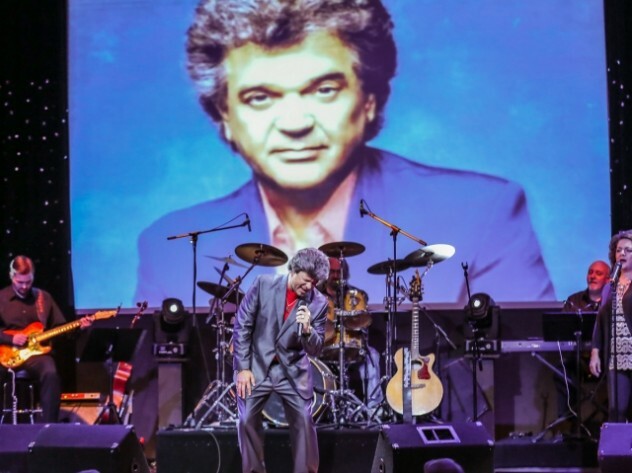 Delivered with passion by tribute artist, Mike Walker, “Conway Remembered” performs countless #1 hits of Conway Twitty who made his last concert appearance right here in Branson, Missouri. Famous for country and pop songs during his 35-year music career, Conway Twitty’s charm and unmistakable sound made avid fans who love country and pop music. Don’t miss to see Mike Walker’s impeccable impersonation as he serenades long-time and new found Twitty fans alike, letting Branson audiences feel the spirit of the Grammy Award winning singer and songwriter. With this tribute show, Mike Walker brings to life the music of Conway Twitty. Despite Conway Twitty’s untimely death in 1993, his spirit lives on through the talent of impersonator Mike Walker. Twitty hadn’t just made a success in country music, he also had a great success in early rock and roll, R&B, and pop music, and he held the record for the most number one singles of any act (a total of 40 Number 1 Billboard country hits), until George Strait broke the record in 2006. From 1971 to 1976, Twitty received a string of awards from Country Music Association for duets with Loretta Lynn, and he was inducted into both the Country Music and Rockabilly Halls of Fame. “Conway Remembered” is a tribute show in Branson which brings to life the music of Conway Twitty through impeccable impersonation of Mike Walker.